Chrysanthemums, often referred to as mums, are a popular fall flower that adorn the decks and patios of homes across America in late summer and well into the fall. The daisy-like blooms range in color from pale yellow, white and pink to brilliant shades of orange, purple and red with many hues in between. 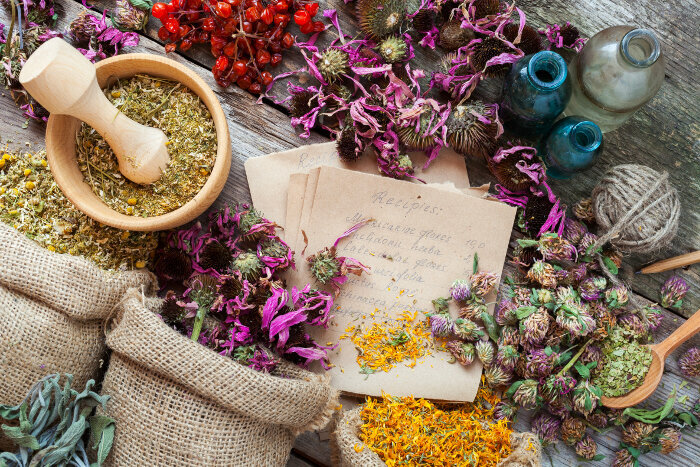 Many are surprised to learn these flowers have also been part of Chinese herbal medicine for thousands of years. Tea made from the flowers of the chrysanthemum plant is thought to treat a host of ailments and to promote long life. What Is Chrysanthemum Tea Good For? Chrysanthemum tea is known as a cooling tea that is thought to balance internal body temperatures and to rejuvenate the body by purifying the liver, but that’s not its only use. Here are some common health benefits from chrysanthemum tea. You can buy commercial chrysanthemum tea, or tea blends that contain chrysanthemums, in the grocery store or supermarket in either the coffee and tea aisle or the organic food aisle. You can also find dried chrysanthemum flowers in health food stores or at a Chinese herbal store. If you are so inclined, you can grow your own chrysanthemums in your garden and use the blossoms for tea, but you will need to dry them first. Do not use the blooms from chrysanthemums sold at plant centers or home improvement centers in the fall, as they have been grown for ornamental purposes and have likely been treated with pesticides. If you want to grow your own chrysanthemums at home, choose a variety that is hardy for your region. These perennials thrive in UDSA plant hardiness zones 3 through 9, depending on the variety. Plant them in a sunny location in rich, well-drained soil. Pinch the new leaves back every two to three weeks from late spring to midsummer to force the plant to produce compact foliage and abundant flowers. Stop pinching the plants by late July or early August or whenever you see the first tiny flower buds. How Do You Dry the Flowers For Tea? For the best tea you need to dry the chrysanthemum flowers. The good news is that after you dry them you can store them in an airtight container and enjoy their health benefits all year. You can dry them in a dehydrator, but don’t worry if you don’t have one. The oven will work too. Here’s how to dry them in the oven. Pick the flowers before they are fully open. Some prefer to pick them during the bud stage. Clean the flowers to remove any insects or plant debris. Preheat the oven to 200 degrees Fahrenheit and then turn it off. Place the flowers in the oven, leaving the door ajar to allow excess heat to escape. Stir the flowers occasionally to dry them evenly. It may take anywhere from 30 minutes to several hours to dry the flowers, depending on the size and number of the flowers you are drying. Remove the dried flowers and allow them to cool. Use them to make tea, or store them in a dark place in an airtight container. Chrysanthemum tea can be made with chrysanthemum flowers only, or the flowers can be combined with other herbs in recipes to make your own herbal tea blend. Here’s how to make the tea. Choose a base of black, green or white tea for your herbal blend. Although this is not necessary many enjoy the added flavor from the tea base. If you are concerned about the caffeine content in the tea base, skip this step and make tea with just the chrysanthemum blooms. Select 6 to 8 chrysanthemums flowers per cup of tea. Place the chrysanthemum flowers in a cup or bowl and rinse them with hot water. Bring a pot of water to a boil and allow to cool to 100 degrees F.
Pour the water over the flowers and tea base and allow it to steep for 3 to 5 minutes. Sweeten with honey, sugar or your favorite sugar substitute and serve hot. You can also allow the tea to cool and serve it over ice for a refreshing iced tea on hot summer days. Like other herbal teas, chrysanthemum tea is considered safe for most people, but there are some people who should observe caution before consuming chrysanthemum tea. Plant Allergies: People allergic to plants in the Asteraceae/Compositae family such as daisies, marigolds and ragweed, may be sensitive to chrysanthemums. Pregnancy & Breastfeeding: According to Web MD, there is not enough evidence to support the safety of consuming chrysanthemum tea during pregnancy or when breastfeeding. It is best to avoid it during this time. 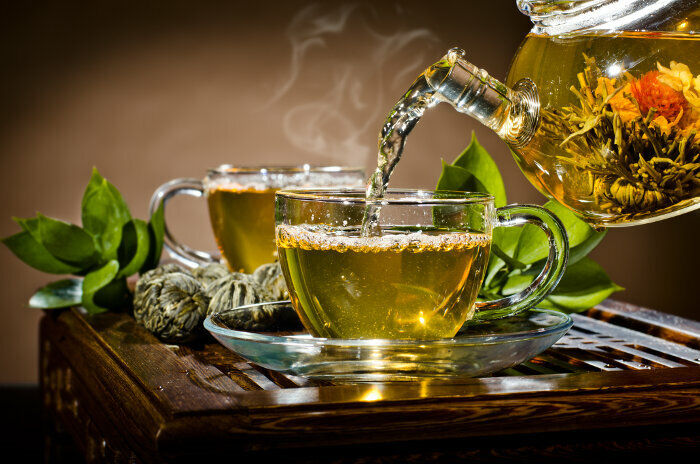 Prescription Medications: People taking prescription medications should check with their doctor before consuming chrysanthemum tea as it may interact with some medications.